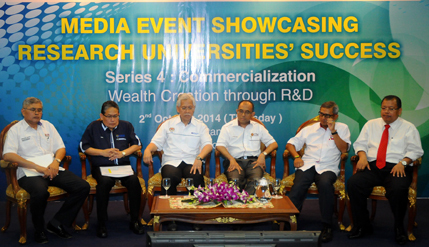 Scudai, Johor, 2 October 2014 – Five national research universities have generated revenues worth RM3.6 billion through research and development (R&D) between 2007 and 2013. Education Minister II Datuk Seri Idris Jusoh said the revenues were earned through the commercialization of research products valued at RM1.25 billion, of which and R&D focusing on the 12 National Key Result Areas (NKRA) accounted for RM205.14 million. Idris was speaking at a press conference after opening the exhibition of successful research universities, titled ‘Research Universities Success Series 4: Generating Wealth Through Commercialisation of R & D’ at Universiti Teknologi Malaysia (UTM) here today. The National University of Malaysia (UKM) participated in this exhibition as one of the research universities. According to him, since 2007 until last year, the government had approved an allocation of between RM50 million and RM90.8 million a year under the provision of management to every research university worth RM2.363 billion. During this period, RM48.7 million was raised through commercialisation of 1,650 intellectual property licenses generated through R&D activities. The amount is expected to increase to RM122 million by 2020. Idris said, 77 downstream companies had been established to enable commercialisation of innovation from university researchers. “The increase in research and development activities among research universities are expected to raise the establishment of downstream companies to 80 per year in 2020,” he said. In the same period, a total of 182.720 jobs were created. The two-day exhibition featuring successful research universities and was the fourth in a series of five events. This exhibition focuses on Inventions and commercialisation hosted by UTM. For each event every research university is responsible for promoting science and innovation to help the country achieve developed nation status by 2020. UKM was given the responsibility to showcase economic and social impact and will host the exhibition in November. Four universities including UKM were awarded Research University status in 2007 under the 9th Malaysia Plan and UTM in 2010 under the 10th Malaysia Plan. All five institutions that are increasing focus on graduate studies, especially at the PhD level as a catalyst for research and development.